Much like estrogen, progesterone is a vital hormone in women. It is essential to the female reproductive system and is mainly responsible for regulating the thickness of the inner lining and maintaining the embryo development at early stages. Sometimes, the natural levels of progesterone decrease or become unbalanced, which leads to a lot of unwanted changes in women’s bodies and adversely affects their reproductive health. This is when the need for progesterone replacement therapy arises. With bioidentical hormone therapies being conducted at Iuventus medical center, you can now have your progesterone levels boosted in the most effective manner. What makes our treatments different from traditional ones is that they are proven to bring the desired results. The thing is that bioidentical progesterone is produced from plant hormones and, thus, is 100% identical to progesterone secreted by the ovaries. That means it imitates the natural hormone and serves all its functions without having a severe impact on your reproductive system. So, if you are considering going for hormone replacement therapy with progesterone, Iuventus medical center is a clinic you’ve been looking for. We provide bioidentical HRT treatments to contribute to your health naturally. 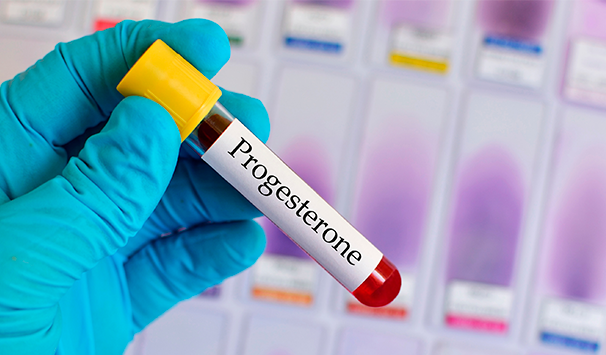 Since progesterone is aimed at maintaining pregnancy by providing a favorable environment for a fertilized egg, women who have difficulty conceiving may benefit from the replacement therapy with this hormone. The treatment is intended to supply them with the amount of progesterone that is perfectly enough to ensure the optimal condition of the endometrium, which is needed for the early embryo to develop. In addition to fertility-related uses, progesterone hormone replacement therapy may be advantageous for those who suffer from irregular menstrual cycles, abnormal uterine bleeding, cramping abdominal pain, or some other manifestations of the hormonal imbalance. Besides, HRT is proven to help women whose periods have suddenly stopped. Approaching menopause brings about dramatic changes in your periods. As a result, your reproductive system is no longer functioning as it used to be, which is likely to cause many unpleasant symptoms. Keep in mind that HRT with progesterone is not suitable for all patients. There are many contraindications that may require you to withhold this treatment (including uterine or ovarian cancer, blood clots, liver disease, etc.). In some cases, progesterone may be given in combination with other hormones to bring the desired effects. To determine which treatment is your best fit, and whether you need it or not, feel free to come to Iuventus medical center in Las Vegas and talk to the most experienced doctors in the field.